The following story is Lieutenant Charles Napier Cross remarkable escape and 450 mile journey through German-occupied Italy to freedom. Lieutenant Charles Napier Cross a Platoon Commander in 'C' Company of the 1st Battalion Worcestershire Regiment was captured at Rigel Ridge, Libya, on 14th June 1942. shortly after he was transferred to Italy and imprisoned in Campo 21 at Chieti from 4th August 1942 to 4th August 1943. During this time he was involved in three escape schemes. On 4th August 1943, he was moved again to Campo 19 at Bologna. During August six British officers at the camp continued their tunnelling operations, and decided to make a new passage under the cookhouse. They knew the British officers at the camp were going to be moved, and their idea was to stay in the hole, for days if necessary, and come out after the camp had moved. Then came their first shock. Five of them got into the hole and waited for 15 hours. Coming out to reconnoitre they found that instead of the Germans having left the camp they had moved the British officers and taken the camp over as a barracks. On 12th September 1943 there was a dash for freedom, Lieutenant Cross was second of the five to escape over a 12 ft. wall surmounted by another 4 ft. of wire. Bare-footed he went over another barrier of barbed wire, ran into the vineyards and began his great trek. After walking some miles with swollen legs and blistered feet he called at a villa and asked for shoes or boots. The occupants gave him boots and civilian clothes, and speaking Italian he was able to pass as an Italian civilian. After walking another 10 miles, he came between the railway and the road that ran to a town and jumped on a train in a siding. With a handkerchief over his head to the complete the illusion that he was an Italian, he travelled for 100 miles as a passenger. At the end of this journey the Germans searched passengers for arms, but his nationality escaped detection, and he made for open country. Occasionally, he got lifts in a mule cart; more often he walked, passing from village to village until at last he decided to make for Naples. A peasant warned him that it was impossible to get over the hills so he turned back to a town on the Adriatic coast. He had little sleep, rising at about one a.m. and travelling through the night and day until 10 p.m. when he had a couple of hours’ sleep and was off again. For food he helped himself from the vineyards. In the villages he bought macaroni and spaghetti and sat at cafe tables with other Italians. Sometimes he was asked too many questions. He escaped from a difficult situation by saying he had been with one of the Bersaglieri regiments, and, pointing to a mark on his face, said he had suffered a wound which made talking difficult. He had little trouble in bluffing the Germans. Sometimes an Italian who guessed his identity would shake hands with him, and, with a sly wink, help him on his way. When some 30 miles from the British lines a group of Italians mistook him for an escaping German and put him in a local gaol. 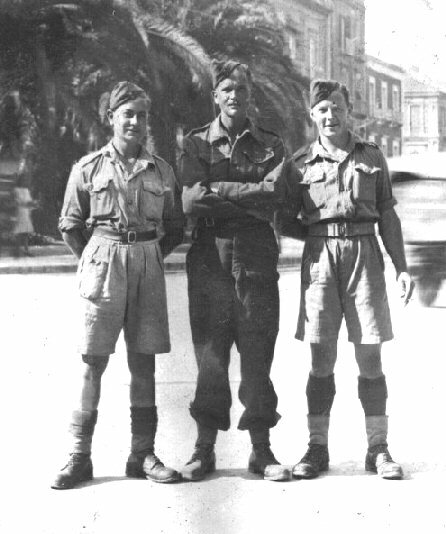 But he managed to get out and shortly afterwards arrived at a town where he met a platoon of British paratroops.